A peek inside the console. Missing from this figure are the myriad cables that festoon the console’s interior space; the typical PC’s console is a lot less roomy. And, if you’ve owned the computer for a while, some dust is in there too — maybe even cat hair! 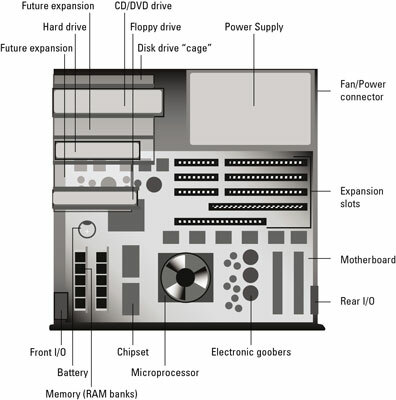 The disk drive cage: A contraption used to hold internal disk drives, an optical (DVD) drive, and a hard drive. The cage also has room for even more disk drives (the so-called “future expansion”). The power supply: Feeds the console that all-important stuff called electricity. The motherboard: The computer’s main circuitry board. Everything inside the PC’s case is a modular component: Individual pieces can be replaced without having to toss out the entire console. Modularity is one of the keys to the PC’s success over the years.